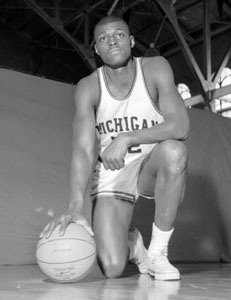 An All-American in 1964 and 1965, Bill Buntin, a talented 6-7 center from Detroit, led Michigan to the Big ten Championship in 1965 and a second place finish in the NCAA Tournament. A three-time All-Big Ten selection, Buntin was known as a ferocious rebounder; he led the conference in rebounds as a sophomore, snaring 15.7 per game. Over his three-year varsity career, Buntin scored 1,725 point (8th on Michigan's all-time scoring list), averaged 21.8 points per game (4th on UM all-time list) hauled in 1,037 rebounds (2nd all-time) and averaged 12.1 rebounds per game (2nd all-time). Together with Cazzie Russell, Buntin led the resurgence Michigan's basketball program. To honor his contribution to the program and his style of play, each year the Michigan team honors its best players(s) with the Bill Buntin Most Valuable Player Award.